There are incorrect methods and tools to clean lens and filter optics. There's a great deal of information available on the topic of lens cleaning—some of it conflicting. So, let's try to keep things simple, and find the best and safest way to get your lenses clean, so that you can spend more time making photographs, and less time on cleaning chores. "When you use your gear, it's going to get dirty..."
Glass is relatively hard and durable. However, when advanced coatings and other chemicals are added to the lens, it becomes a surface that's more vulnerable to scratches and damage from chemicals and contact. Because of this, we want to try to keep our lenses and filters free of fingerprints and dirt, and avoid repeated physical interaction—this includes touching the lenses and—yes—cleaning. When stored in your camera bag or on your shelf, judicious use of front and rear lens caps will help keep your optics clean. But, when you use your gear, it's going to get dirty. This cannot be avoided. Your lenses will benefit from an occasional cleaning of your camera bag innards, as dust and dirt will likely find a home inside your bag and attach itself to the lens. Dust is everywhere and everywhere is dust. It will get on and inside your lens. Lenses are manufactured in extremely clean factories, where manufacturers go to great lengths to try to eliminate dust from the environment. Even then, brand-new lenses may have dust between the lens elements. Dust, however, is not the main enemy. A lens that sits on a shelf in your home for years and collects a thick layer of dust will, obviously, produce image-quality issues. But, a few specs of dust here and there on or inside the lens will have no effect on image quality. A few specs of dust on or inside the lens will have no effect on image quality. That statement was intentionally repeated. "Dust is everywhere and everywhere is dust... Dust, however, is not the main enemy..."
Trying to keep your lenses dust free through continual cleaning may serve to shorten the life of your lens, as you run the risk of scratching the lens surfaces every time you clean the glass. Oily fingerprints and smudges on the rear element will have the most dramatic impact on image quality, because of the way that the light is focused narrowly through the back of the lens. The good news is that the rear element of the lens is less susceptible to dirt and oil because, when mounted on the camera, it isn't subject to kids' sticky fingers, your sticky fingers, or other environmental dangers. Remove as much dust and dirt as possible from the lens with a blower or soft-bristled brush. Apply a few drops of lens cleaning solution to a lens tissue or cleaning cloth. Using a circular motion, gently remove oil, fingerprints, and grime from the lens surface, working from the center outward. Remember, you can perform those three easy steps in the field when needed but, unless there are greasy fingerprints or oily smudges on your lens, avoid unnecessary cleaning. You don't need to be in a dust-free "clean room," and don a vinyl suit and rubber gloves to clean your lens. The parts of the lens that are most exposed to the environment are the front element and the barrel of the lens. The best way to protect the front element is to attach a high-quality filter. The filter, generally much less expensive than the lens itself, will serve as a sentry that absorbs the gunk headed for your expensive lens optics. The filter will be cleaned in the same manner as any other lens. A dirty lens barrel will not degrade image quality, but keeping the lens barrel clean may help avoid potential issues with the mechanics of the focus and zoom mechanisms. Use a lens cloth or tissue and lens-cleaning solution to keep your lens barrel clean. When it comes to dust removal by air, the best method is to use a blower, and to avoid using compressed air. Without a blower, you can always blow on the lens with your own lung power, but beware of spraying your lens with saliva or your lunch. A blower should be mandatory equipment in your DSLR camera bag for sensor and lens cleaning. There is a multitude of lens-cleaning brushes on the market. A high-quality one is recommended. Camel hair works very well. Also, do not touch the brush bristles with your oily fingers, unless you want to transfer grime to the lens while cleaning. Lens tissue is relatively inexpensive. One use only, please. Discard the tissue after cleaning your lens. 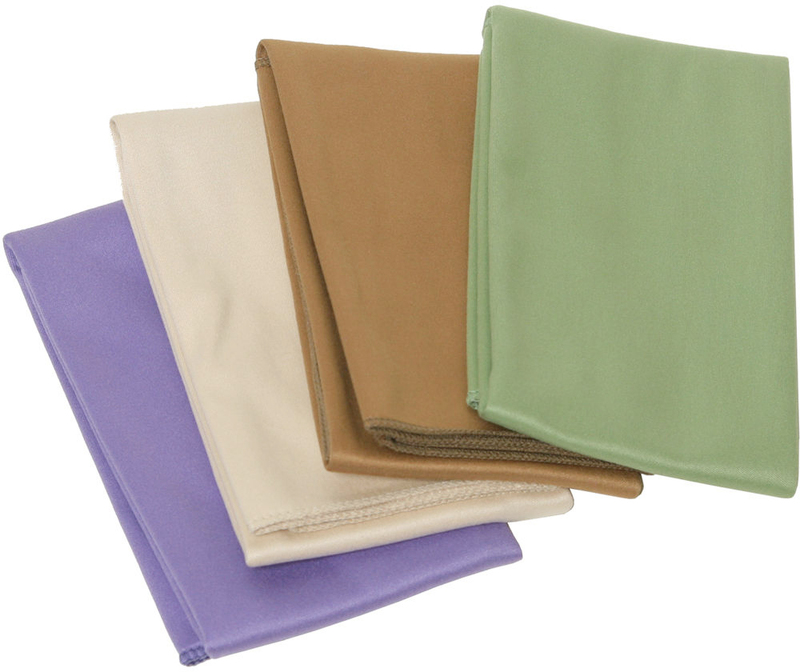 Microfiber cleaning cloths are popular as well. There are a few precautions to help ensure their beneficial use. Keep them clean, as they will likely be used for multiple cleanings, and you do not want to re-apply dirt and grime or particles that may scratch your lens. If you wash the cloth, avoid using liquid fabric softeners, as they may leave a chemical residue on the cloth and create streaks on your lens. Use your cotton T-shirt at your own risk. Again, if the lens does not need cleaning, do not clean it, but if you find yourself separated from your lens-cleaning gear and need to remove a smudge, using a clean 100% cotton T-shirt and warm breath is not the end of the world. Again, avoid liquid fabric softeners. You will find better (and safer) results with dedicated lens-cleaning tissues and cloths. Cotton swabs are a good option for cleaning, and can be especially effective for cleaning the edges of a lens. Facial tissue is not recommended, as some brands are abrasive and others contain oils and lotions that can streak your lenses. Many lens manufacturers market specially formulated lens-cleaning solutions designed to accommodate optical coatings. Again, these are relatively inexpensive, but if you want to make your own solution, or store a 50-gallon drum of the stuff, the use of reagent-grade isopropyl alcohol is recommended. De-ionized water is also safe, but is not a dedicated cleaner and, like moisture from warm breath, will only be effective on water-soluble smudges. Do not use acetone. Acetone is a great cleaner, but, when used on camera lenses, it could have adverse effects on the plastic and paint of the lens barrel, as well as the optical coatings. Again, do not use acetone. "Oily fingerprints and smudges on the rear element will have the most dramatic impact on image quality, because of the way that the light is focused narrowly through the back of the lens..."
Using household window cleaners is not recommended on coated optics. Stick to the dedicated lens-cleaning solutions, alcohol, or de-ionized water. Apply the cleaning solution to the tissue or cloth, instead of directly to the lens. There are several reasons to do so. You want to avoid having beads of liquid running to the edge of the lens element and then entering the lens body. 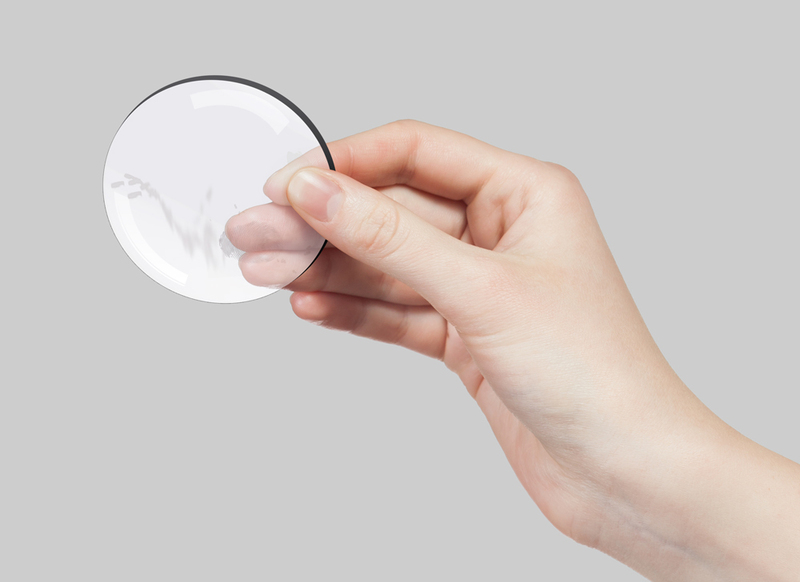 Even weatherproofed lenses might not be watertight, and the liquid may enter the lens body due to capillary action. Liquid droplets function as a lens and may focus sunlight to a point on the glass lens surface creating a super-heated area that could damage the lens or coatings. Also, mild liquids and water can have corrosive properties if left in contact with a surface for a length of time. Wiping in concentric circles will reduce the occurrences of streaking more than working across the lens. Working from the center to the edge will move debris to the edges of the lens, away from the center of the image circle, in the event the objects do not get removed. When wiping, apply only enough pressure to remove the offending smudge. On a DLSR (or SLR), when you look through the viewfinder, many times you will see lots of dust specs throughout the image. This dust is on the camera's mirror, and will not affect the photograph. The mirror can be cleaned, but the silvering is very delicate. Also, using air blowers here may blow dust from your mirror onto your digital sensor, which will definitely affect image quality. A note to users of sport optics, telescopes, and night photographers: beware of inspecting your lens for cleanliness with a color-filtered flashlight, as some of the dirt and smudges may not appear. Finally, you may clean your lens mounts (camera and lens) with a cloth and lens-cleaning solution. The digital contacts that allow the lens and camera to communicate may require occasional cleaning. Be sure to use a different cloth from that used for the optics, as wiping a metal lens mount to clean it may impart tiny metal debris on the cloth that should never be introduced to the glass. Remember the three simple steps, remember that dust happens, and be sure to spend more time making photographs than cleaning your gear. It worked and the spots disappeared. The cleaning element of the LensPen was, apparently, just tacky enough to remove the spots and the filter was saved from the trash can. I recommend adding the LensPen to your cleaning tool kit for situations like this. Sorry if this is not allowed, I'm just starting out on my YouTube channel and would love some feedback, I will remove the comment if not allowed.... Keep Snapping! I did remove the link, but gave a way for folks to find you. I have recently created this channel as a guide to aspiring photographers and nature enthusiasts. 1 video up now and more to come, thanks for your time. No worries, George. Good luck, sir! I have a Nikon Coolpix S4200 and the lens may need cleaning, but the Lens Cleaning instructions for this camera specifically state: "Do not use alcohol, thinner, or other volatile chemicals." Myself not having degrees in Chemistry or Sorcery I really don't know what names other than alcohol do pertain to solutions that are safe to use on my lens. Maybe Nikon doesn't want you to try to clean your lens with beer, whisky, scotch or another adult beverage! Stick with any commercially available lens cleaner and you will be good to go! Also, B&H Photo may start offering a certificate program in Sorcery. Stay tuned! I'm a little late to this discussion. Hate to bust the balloon (or lower the stock price of J&J) but the cardboard that holds the cotton swab is treated with a waxy substance or polymer that dissolves in alcohol on their Qtips and can leave a residue on your lens. Urge people to use specially made Qtips with wooden sticks only and only when Qtips are necessary. Secondly, in spite of your best efforts, I still see people commenting about using 70% isopropyl instead of pure isopropyl (99%+). The old tried and true method is, after blowing off dust with a hand blower, using nitrile gloves, soak an unfolded piece of lens tissue (not a few drops) with spectroscopic grade methanol, shake off excess, and gently and steadily pull across lens surface once and throw out the lens tissue. Let it air dry. If offending smudges remain, fold a fresh lens tissue into a little pad (maybe a half inch or so wide) and using polycarbonate or polypropylene hemostat (forceps) to hold it, inundate (flood), i.e., thoroughly soak with spectroscopic grade methanol, shake off excess, and then wipe by pulling once steadly across offending smudge. All these items are easily and inexpensively available. Great tips. Very detailed. Thank you! I recently purchased a preowned Canon 135mm lens for my camera (non-DSLR). I went to clean the optics and found the rear lens is recessed beyond normal reach. What tool do I used to get down to the lens? The good news about lenses being out of reach is that you can't get your own grimy fingers down there. If there is dust there, you might try a blower. If desperate and you think that something down there is getting in the way of perfect photos, you could put some lens tissue on the end of a cotton swab (I recommend the name-brand variety) and gently clean the element. Good luck...and be sure you need to do that cleaning before you actually do it! I need to clean my dslr camera (Nikon D610) and film camera, but I wasn't sure which brand of cleaning kits that I should buy. Plus I pefer to buy good quality and cheap. Some of them recommended to buy - Altura Photo, Zeiss, Camkix, Lenspen, or K & F Concept. I am not sure still and it will be wonderful that you can recommend which it is good for my cameras. 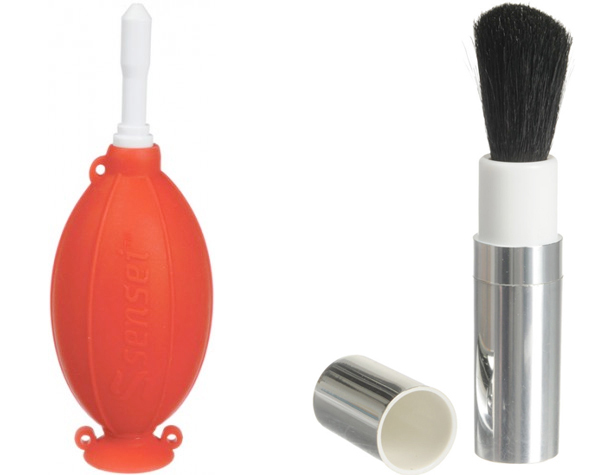 Many cleaning kits are almost identical, but some, like Lenspen, are more for specialty lens cleaning. When you say "clean my dslr camera" I assume you mean your lenses? All you really need is lens tissue and lens cleaning solution and you are good to go. Check the reviews on those products, if you want to narrow your search. I am pretty sure no one is selling anything that is bad for your camera or lenses...it is the technique that can cause problems. Sorry to not narrow it down for you, but keep it simple and get your stuff clean and go shoot! Thumbs up backatya! You are welcome, Rae! Hi Todd, some good tips on here. Enjoyed reading. My question is slightly off the dust topic, but related anyway. In an Olympus IS/L A 28 converter, that is about 25 years old already but unscratched, during a long period of storage and moving across extreme climate zones, a layer of grime accumulated inside the converter. It seems like inside the device water condensated and then dried up on the inside of the smaller lens, leaving a layer as on a dirty window. I notice that, provided I have a correctly sized spanner, I could screw the front lens off and thus clean the inside. How risky would that be ? Any other suggestions how to get rid of this dirt layer without sending the lens in for a service? I cannot find any information on that lens, do you have a longer or more formal name for it? My internet search has failed me, but I did learn about Olympus and a bit of a mess with UCLA medical! So...disassembling a lens on your own. I am sure it can be done, but do it at your own risk. I would look for YouTube videos by folks who have done it on that lens (or similar lenses) and see what lessons they learned so that you don't have to learn your own. I know it's sort of a copout but you might consider a pro to clean it all first time. He could show you how to do it so hopefully it would be a one time shot. You could get an estimate first. G9o9od luck Bert. Proud of you using film! I've got a visible speck of dust in the first inner lens from the front in the lower left quarter. I can see it when looking into the lens from the front. It doesn't show in stills so far, maybe because of what I'm shooting, but it's easily seen in video along with an other spot that I cant see when looking into the lens. when I noticed it and tested again but both spots are still there. So what's you take on this problem? Great question. To me, that looks like sensor dust...not something caused by the lens. Are you seeing those spots when using other lenses? My guess is that you are. To verify, shoot some blank daylight blue skies with your lens or lenses stepped down to their smallest aperture (i.e. f/22)...and then look at the images on your computer. This will show you if you have sensor dust, or not. And then it will be time to clean your sensor. If I am wrong, these spots will only appear when using that lens...and we have to re-address the issue. Let us know what you find! I havent seen the problem with other lenses on the camea but I rarely shoot at f/22. And the problem video with the spots was shot at f/22 because it was very sunny. I did a test yesterday with the same lens on my second camera and yes ... I believe you're correct. No problem spots with yesterdays test at f/22 or other f-stops so it's most likely the sensor. The camera is a Panasonic GH2. Is the sensor shake (in the menu) the way to clean it or should it be taken to a Panasonic service center for manual cleaning? just looking up at clear blue sky. gh2 is a 20mm sensor ... and the arctic butterfly. I suspect mine is going to need a wet cleaning. Anyway, good news is that the sensor dust doesn't show at lower f-stops. Thanks for the discussion. I'll be keeping an eye out for your tutorial on sensor cleaning. No worries! Good luck! Hopefully you don't need to send it in...try the sensor shake and maybe a blower before you do a wet cleaning. The spots you see on the image are caused by dust on your digital sensor...not on the lens or inside the lens. Almost definitely sensor dust! Thanks for stopping by! We have an article coming out soon on sensor cleaning. My nikon lens had a spot. I tried to clean it with a q tip. Now ther is a circular piece that came loose in there and I can't use it. May you give me some more information? Was the loose circular piece a result of the cleaning? Were you cleaning the front or rear element? Which lens is it? Can you identify what part came loose? Well I haven't looked at it in 5 months. It is the inner lens I believe. Because it is in. Not Ratteling but I can't turn the focas to the right. Sounds like your lens is due for a trip to a repair shop or back to Nikon! Sorry, mate! Using a lens cloth is often recommend along with some kind of liquid product, typically isopropyl alcohol. However, lens cloths easily get dirty just as lenses do, which leads to the recommendation of disposable lens cleaning tissues. I've heard that In hi-tech delicate industrial applicationss including electron microscopes and mirrors for astronomical telescopes, one-use Kimwipes are used. Would these be appropriate for camera lenses? They're very convenient and not overly expensive. According to the Kimberly Clark website, they are designed for lenses, so I would say you are good-to-go! I crunched the numbers. The Kimwipes cost about $0.02 per wipe. Our Tiffen lens paper is TWICE as much at $0.04 per wipe! HUGE savings! After 1000 lens cleanings, the Kimwipes will have set you back $21 and the Tiffen paper $40. Unless you are doing a lot of lens cleaning, I think the savings over a lifetime are pretty minimal, but, hey! Go for it! I attempted to clean the rear element of my Nikkor afs 20mm f/1.8 with a Tiffen lens tissue but it felt like there was resistance between the tissue and glass. I assume that's because of the coating on the glass? The tissue also made a sort of "screeching" sound so I stopped. Would a liquid lens cleaner be ok if applied to the tissue first? I guess the coating could create resistance. Did you see any marks on the glass after the fact? Yes, liquid lens cleaner will be OK as long as, like you said, you apply it to the tissue first. This is especially important when cleaning the rear element. I have a 24-70mm 2.8 L II lens and im not sure how this happened but i see a water spot inside of the front part of lens. Its a problem becasue when using the lens the photo or the video shows a blurry spot on subject. How can i get this repaired. Obviousley i cannot do it myself. I assume you mean that the droplet is in between the first two elements of the lens and not between the lens and filter, correct? The obvious solution is to send the lens to a Canon service center and have them take care of it. But, before you do that, if I were you, I might try to store the lens in a warm spot, or out in the sun for a bit to see if I could get that water to evaporate. [Hopefully it is water and not oil.] This is a complete and total guess...I have no experience with this solution, and no way to test it...just a hypothetical solution for you to try before you send the lens in! Let me know if you try it and if it works! Addition top my comment below: nitrile gloves, not latex. and get 'denatured" alcohol from pharmacy or lab supply that is 99% alchohol, the hight test stuff. For persistent greasy film that wont come off with alcohol products, try very carefully optical grade hexane on cotton or q tips. have to be careful because hexane will disolve things like balsam and other glues used on internal lens parts. just be sure you don't flush surface with hexane and stay away from edges. I'm startled your illustration above shows some person's right hand holding some filter, piece of optical glass with their bare hand and with their fingers directly on the lens/filter surface. Aside from filters that can be washed in dish tetergent in the sink, all optics should be handled with latex gloves and handled only by the edges. The easiest way to clean fingerprints from lenses is dont touch them with your fingers. I've been cleaning filters in warm running water and dish detergent for 40 yrs and have never had a problem. if you have trouble with streaking, pour isoproply alcohol over surface after rinsing to accelerate drying. If that doesnt work dry with hair dryer to speed drying even more. Of course you would never do with a camera lens. Thanks for sharing your process! Very interesting, even though I haven't been in the market for a hairdryer since I was in grade school! I wouldn't advise breathing on your optics in an attempt at "cleaning". Even the cleanest mouth is full of bacteria, which can cause the growth of cultures, or "lens fungus". I have heard that advice as well. The best way to clean is with lens solution and lens tissue or a cloth, but, if you are in the field and have no other options, the breath might be your best bet. Based on the amount of dentistry I carry around, I would imagine that I have a higher-than-average amount of yuck in my mouth, and even my oldest lenses (decades of getting breathed on occasionally) have not shown signs of gingivitis or cavities. Still, its good to err on the side of lens cleaner! Hi Todd Thanks for yor article and humour. I am in despair..i have a nikon cp610 and I can't get rid of the smears on the lens. I have tried lens cleaner and tissues many times and it like the pink in The cat in the hat, it moves around but won't leave. What can I do?? I guess I must have touuched the lens at some time and once some citrus pollen blew on it while a was taking a bee pic. Thanks for this opportunity to ask. If you see the banter below with "Dave" from NYC...I think he had sort of the same problem. On his lens, I had success using a Lenspen to get a stubborn film off. You could try that, just make sure your lens is free of dust and other material before you apply the Lenspen. Also, if you aren't noticing any degradation of your images, you can just ignore it. A lens has to be pretty dirty before you see any effects on the images. You might need smaller fingers! You should still be able to dampen a lens tissue and get to the front element. Once you get that clean, put a filter on that sucker and just worry about keeping smudges off the filter! Or, because I now own Q-Tip stock, you could put lens paper around a Q-Tip and use that to get deeper. I've cleaned my Panasonic Lumix TZ-30. Disassembled it, blew on lens(didn't disassemble sensor), and wiped it a bit with dry microfiber cloth. Now when I take photos in sunlight, they are incredibly bright. You can barely see what's in the picture. Did you actually remove the lens, or did you just clean the front? Cleaning the front element of the lens should not cause the problem you are mentioning. I recommend checking and re-checking your settings. It sounds like your exposure compensation might be off, or the camera might be in a mode that is causing overexposed images. Also, there is likely a factory reset option in the menu as well—I would try that if you cannot find a culprit in the settings. Let us know what you find! Thanks for reading! The isopropol alcohol you find on the shelf is 70% alcohol and 30% water. Pharmacists can get a 99% alcohol version if you ask. A very large company based in Arkansas usually has it the day after I ask for it. It's not expensive, lasts a long time, and evaporates much quicker with no residue. They also sell boxes of individually packaged Zeiss alcohol wipes that I use after making sure there's no dust. I keep a bunch in my bag with my Rocket blower, and my lenses stay clean. Good stuff! Thanks for sharing the info and thanks for reading! Every time I clean a lens, I wonder is this the time that I'm going to scratch my lens, so I'm always extra careful. In your three-step process, you don't mention wiping it dry after applying the cleaning liquid. Are we supposed to let it evaporate, and if it evaporates, will that not leave a residue? Also, I always get a fine line of residue on the edge of the lens on the eyepiece of my binoculars after cleaning. Do you know what could cause that? It's always good to be extra careful! Just to be clear, you don't want to apply the cleaning liquid directly to the lens. You should be squirting it on the lens cloth or paper. That will cut down on what is left over. In my experience, most of the cleaning solutions dry fairly quickly without leaving a residue. One way to help speed the process is to wipe the lens a bit longer, if you have too much liquid on your cloth. I just cleaned a pair of binoculars last night after they got salt spray on them and know exactly what you are talking about. I think that is a build-up of grime and oil that gets pushed out towards the edges when you clean the lenses. I can get most of it out by using a cloth-covered fingernail that allows me to clean out the edges pretty well. I am sure the same thing happens with a camera lens, its just not as noticeable as it is on binoculars/telescope eyepieces. I used the following things. Apply the cleaning solution to the tissue or cloth, instead of directly to the lens. There are several reasons to do so. You want to avoid having beads of liquid running to the edge of the lens element and then entering the lens body.